Brian R. St. James is pleased to join Cosgrove Law Group, LLC where he will focus on general corporate transactions with a concentration on commercial lending transactions and general commercial litigation. Mr. St. James' extensive background provides him with a wealth of knowledge related to corporate legal needs and solutions. He also offers years of experience in other matters the firm handles such as securities arbitrations, protective orders related to corporate disputes, and employment discrimination matters. Mr. St. James comes to Cosgrove Law Group, LLC from a diverse background of private sector corporations and law firms. He was general counsel to the CIT Group, Inc. core business that engages in vendor financing transactions in the U.S., Canada, South America, Europe, Asia and Australia, after also being chief counsel to the business credit unit of CIT where he negotiated and drafted syndicated loan agreements and related documents for acquisition financings and asset-based lending transactions, and counsel to the equipment leasing unit of CIT when he negotiated and drafted equipment leases. Prior to CIT, Mr. St. James was an associate with Dentons where he was lead counsel to several banks in commercial loan transactions and portfolio sales, associated with bond counsel in representation of several school districts and other issuing authorities, and represented several hospitals related to the integration of physician practice groups. While also at Dentons, Mr. St. James went to Japan for three years where he provided legal advice and representation to global clients of a Tokyo law firm. Prior to Dentons, Mr. St. James was senior counsel to ITT Commercial Finance Corp., where he concentrated on negotiating and drafting equipment lease documentation under the Ship Mortgage Act and Article 2A of the UCC for transactions to lease and finance slot machines and other gaming equipment on barges for river boat casinos. He also negotiated and drafted documents for hundreds of commercial loan and equipment lease transactions and several purchase agreements and related documents for large portfolio acquisitions, including portfolios of SBA guaranteed loans. 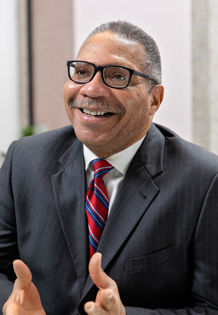 Prior to ITT, Mr. St. James was an associate with Husch Blackwell where he provided legal representation and advice in commercial litigation matters, including serving as lead counsel defending a home builder and rehabber of historic urban neighborhoods. Prior to Husch Blackwell, Mr. St. James was a Captain (O-3) in the U.S. Army Judge Advocate Generals’ Corps where he was special counsel to the Army General Counsel and coordinated compliance with subpoenas and document production requests issued by the Office of the Independent Counsel and Congressional Committees investigating the Iran/Contra matter. Prior to that he served as chief prosecutor for a U.S. Army post in Korea, as well as serving as appellate counsel representing the U.S. Army in cases before the Army Court of Military Review and the U.S. Army Court of Military Appeals. He was awarded the Army Commendation Medal (2nd Oak Leaf Cluster), Army Service Ribbon, Overseas Service Ribbon and the Parachutist Badge. Mr. St. James received a Bachelor of Arts degree in Economics from Marquette University and a Juris Doctorate from Cornell University School of Law.